This great snipper scissors is so handy to have around, plus with its own sheath it is safe to throw in your stitching bag or stash to take along with you. 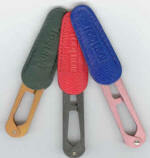 Assorted colors of sheath and snip make these snippers fun and vibrant. Snip is 4" long, with 2" sheath. These 3.5 " fine needlepoint scissors are constructed out of stainless steel, have purple acrylic handles, a lifetime guarantee and come with a leather sheath. Scissors that are colorful, attractive and are sure to appeal to scissors collectors and needle workers alike! antique gold finish. Now this popular product comes in a larger size - specifically for cutting larger threads, or yarns! Wear this as a pendant or set it atop a thread spool and you will always have a thread cutter handy! It is designed with a sharp circular blade inside so that threads can be cut using any of the grooves. Approved for airline travel. 3.5 Stork. Amazing Stained Glass Scissors is created with a heat transfer process that produces beautiful stained glass colors on the scissors handle. 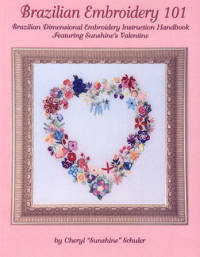 Ideal for cross stitch and other embroidery. 3.5 stork scissors. European manufactured. 3 1/2 Nickel-plated blades gold-plated Handles with leather sheath. 3-1/2 embroidery scissors, packaged with a leather sheath. Has slim blades, sharp tips and is perfect for intricate needlework. Nickel-plated blades and gold-plated handles. The new Epaulette scissors is an 18th century French reproduction. 3 1/2 " Nickel-plated blades and gold-plated handles Embroidery scissors with fine, sharp tips and packaged with a leather sheath. Has slim blades, sharp tips and is perfect for intricate needlework. The new Epaulette scissors is an 18th century French reproduction.